Matthew Gray has updated his boardgamer clusters. Worse yet, he’s added wonderfully geeky spider plots! There’s even a new analysis tool that produces numerical and graphic analysis for individual games, or for gamers based on their top 10 games. I got a copy of the Überplay Ra for Christmas, and it has become my game group’s new obsession. It’s been played five of the last seven nights (not game nights, actual nights — vacation time for the holidays and unusual schedules are syncing up just right), including two nights I wasn’t free — they borrowed it so they could play without me! I had played a lot of Ra already on BSW, so I knew that it was very good, and I expected it to go over well, but this is the hottest reaction to a game ever from my group. An Introduction to Elegance has been nominated for a 2006 Gone Gaming Board Game Internet Award for Best Industry Article. I am humbled and honoured. 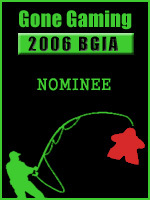 This is the second year in a row that I have been honoured with a nomination for a BGIA. Last year I was lucky enough to win for Best Strategy Article for my Princes of Florence series From the Library to the Laboratory over on Boardgamegeek. I doubt that an Introduction to Elegance will win, since it is a rather tough field. If I had actually managed to get the follow up articles done, perhaps I might have earned a second nomination for article series. Alas. Good luck to all of the people nominated in all of the categories. While I am not familiar with all of the nominee, I am sure that all are deserving of being recognized.